The Neuro Times: Book Review: Toby A. Appel, Shaping Biology: The National Science Foundation and American Biological Research, 1945-1975 (Baltimore & London: Johns Hopkins University Press, 2000). 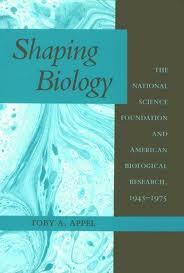 Book Review: Toby A. Appel, Shaping Biology: The National Science Foundation and American Biological Research, 1945-1975 (Baltimore & London: Johns Hopkins University Press, 2000). In the mid-1960s, administrators within the Division of Biological and Medical Sciences (BSM) of the National Science Foundation (NSF) had become convinced that an interdisciplinary “big biology” program was needed. Such a program some felt would possess great rhetorical value in convincing Washington’s political leadership of the need to support biological research. Among the advocates of this approach was Herman Lewis. Lewis believed that among the various potential big biology programs, "neurobiology” would prove the most sustainable. He argued that neurobiology: “will probably occupy the position in the last half of this decade [1960s] that molecular biology has had during the first half" (p. 255). Others were less glib about neurobiology’s prospects. One argued that “establishing new programs in faddish areas” would cast the whole of the BMS in a bad light “by attracting "fund-chasing entrepreneurs" or setting up a "cult of high priests who tend to evaluate proposals not on the basis of whether good experimental procedures are proposed, but whether they meet current fashions and contain the popular catch words" (p. 255). "If World War II had not been a biologist's war...through the exploitation of biological warfare, World War III might well be." Shaping Biology is a study with few rivals. As Appel makes clear, from NSF’s origins in Vannevar Bush’s famous call for governmental support of science, the NSF’s founders had hoped to unify the disparate fields of biology. Telling her story through changes that took place in molecular biology, plant biology, systematic biology, and ecology, Appel makes clear that the pursuit of unity would forever haunt the agenda of the BMS. Also haunting the NSF was the question of the ends of biological research. Rockefeller Foundation officers (who prior to the advent of government support of science had been biology’s largest benefactors) saw significant promise in the social application of biological knowledge. And while biology’s wartime contributions throughout 1939-1945 were in some sense disputed by medical scientists, there was also rather pessimistic recognition that: "If World War II had not been a biologist's war...through the exploitation of biological warfare, World War III might well be" (p. 17). Formally, however, the NSF’s mission was formulated not in terms of application but rather in terms of science for the sake of science. In part this dismissal of the ends accounts for why increasingly BMS’s largest competitor – NIH – came to fund an increasing amount of biological research across the United States. In the first decade, BMS administrators endeavored to fund science infrastructure, support the best scientists, and claim all biological research as falling within their purview. “Big science” projects formed part of this program: BMS support research ships, field laboratories, and large controlled environments. And they also supported large biology education initiatives. As the NSF grew larger in scale, it became so specialized that some wondered whether it could still serve its mission. Against naysayers in the public and political circles, figures within the NSF and BMS carefully deployed cold war rhetoric or appealed to the promise of medical breakthroughs. Charged with also enhancing science in America, BMS administrators also became involved in large sociological surveys of scientific fields, which while sometimes causing great professional controversy and tensions between government agencies and universities, lent a certain practical orientation to BMS’s mission. Although they usually endeavored to avoid controversy of any kind, administrators within the NSF broke with this tradition during the McCarthy Era. Appel recounts how the: “BMS deliberately funded blacklisted biologists and urged the NSF to establish a general policy opposing security checks of grantees. By its eventual action on behalf of scientific autonomy, NSF created considerable good will among biologists and scientists generally” (p. 118). Despite these challenges and controversies in the 1950s and 1960s, in retrospect it is clear that those years were a “golden era” for biological science funding in America. By the 1970s, however, a period of retrenchment and reorganization brought a largely changed culture to NSF. In the Nixon era, the NSF became a more politically engaged organization. Indeed, it in some sense lost its early assumptions and ideals. Finally, the Division of Biological and Medical Sciences was disbanded in 1975. It is this remarkable story that Shaping Biology records. An excellent book, it is one that every student of the modern history of biology should own. Indeed, its record about changing prerogatives in government support of science might also serve scientists who write grants to the NSF today as a useful reminder that patrons tend to be fundamental for the making of scientific knowledge.